Walk along the urban streets of Minneapolis or Manhattan, the rural roads of Nebraska or Wyoming, or inside coffee shops and businesses, and you just might come across a handcrafted box on a post that looks like a little house. Peek inside and explore the literary landscape of books to borrow. Take one if you’d like—and bring back another next time you’re in the neighborhood. “There is profound value in sharing a book that changed your life,” says Rick Brooks, cofounder of Little Free Library and the outreach program manager at the University of Wisconsin–Madison. The Little Free Library movement started when Todd Bol, of Hudson, Wisconsin, built a small model of a one-room schoolhouse as a memorial to his mother, a teacher. He filled it with books and put it in his yard with a Free Books sign. “Neighbors thought it was cute,” says Brooks. 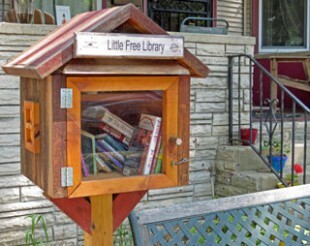 Soon, others decided they wanted little libraries in their front yards, too. Brooks met Bol in 2009 while exploring the benefits of green practices in small businesses. Their shared commitment to service and the quality of community life led them to consider how little free libraries might promote community building and literacy for underserved groups. Their original vision was to see as many little libraries built as Andrew Carnegie constructed—2,510. The goal was met a year and a half earlier than anticipated. They expect to have more than 10,000 registered little free libraries in the world by the end of this year, with many more unregistered or under construction. “It’s caught on faster than we ever expected,” says Brooks. 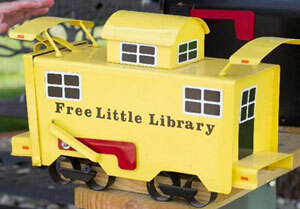 Author Charlotte Endorf and her husband, Kevin, built several little libraries in their small town front yard, including this miniature railroad car. 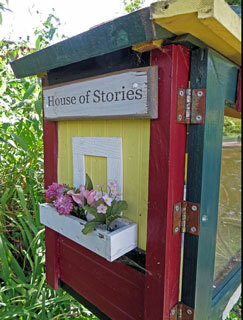 Little libraries can be found in any style imaginable. In New Orleans, there are libraries built out of Hurricane Katrina debris and covered entirely in Mardi Gras beads. In Hadar, Nebraska, a town with no public library, Charlotte Endorf, author of books about small town life, transformed her front yard into a library park. Henry Miller, an Amish man in rural Wisconsin, has built more than 1,000 barn wood libraries from a barn destroyed by a tornado. His libraries are available for purchase on the Little Free Library web site, says Brooks. Just search “little free library” in a web browser and you’ll discover all kinds of wildly creative designs. The whole philosophy of Little Free Library—which can be found now in at least 48 countries—can be summed up in these words on a little library sign: “Take a Book, Leave a Book.” And, the more important the book is to you, the better, says Brooks. He encourages little free library stewards to fill the library with their favorite books, not just books they mean to discard. Naomi Davis, director of Blacks in Green (BIG), an economic development organization in Chicago, Illinois, gave Little Free Library some books from her grandmother from the 1930s and 1950s. “In return, I gave her a book from my own bookshelf, a copy of Cry, the Beloved Country, given to me in 1958 from my mother,” says Brooks. The book included a handwritten note from his mother, given to him when he was ten years old. Little Free Library has also been given hundreds of books published before 1900, including an 1812 Bible and a 20-volume collection by Victor Hugo from the 1890s. Donations don’t stop with individuals. General Mills (Cheerios), for instance, donated 20,000 books to be spread around the country. Book donations are being sent internationally, too. Little Free Library is partnering with Books for Africa and Better World Books to send book-filled little libraries to African countries, including Ghana, The Republic of the Congo, South Africa, and a refugee camp in Uganda. Ethiopia will also soon benefit from books through these partnerships. This spirit of generosity by book lovers encourages community in disconnected neighborhoods, literacy among children and adults, and companionship for socially-isolated older adults. “Realtors say people buy houses near little free libraries, because they want to live in a neighborhood like that,” says Brooks. Little libraries have even become tourist destinations—some people take walking and bicycle tours to find the little libraries mapped on the Little Free Library web site. It’s become an economic driver for small towns where people may not normally visit, says Brooks. People have uploaded pictures and videos to social media sites like Flickr, Pinterest, and YouTube of their little library discoveries. These little libraries are much more than cute tourist destinations or reading shelves for neighborhood children. In India, Little Free Library is partnering with a program called Going to School to build 1,000 libraries, built by young entrepreneurs to support their families. In Wisconsin, young men at the Prairie du Chien Correctional Institution built 58 little libraries to give back to the community. There’s a program filling little libraries with books for kids about growing vegetables and healthy eating in Washington State. Some little libraries go through between 25 and 50 books a month. Some hundreds. Others thousands, says Brooks. The beauty of it all is that anyone can be involved. It’s a grassroots, local movement to promote reading and community—all contained in a 12-inch by 28-inch little library. What are you waiting for? Search for a little free library near you or find instructions to build your own at www.LittleFreeLibrary.org. Naomi Krueger is a freelance writer and avid reader of books, blogs, and tweets in Minneapolis-St.Paul. To contact Naomi or read her blog, visit www.NaomiKrueger.com. This article first published September 2013.